I volunteered at the Shark Lab in 2006 for two months. Since then, I have returned to Bimini over 40 times to conduct other studies relating to shark magnetoreception and behavior. During several of these trips, I conducted my Master’s and Ph.D.-associated research, collaborated on films, and had the honor of working alongside Doc! It all started on September 14, 2006 when I woke up in a Days Inn in Fort Lauderdale, FL after somehow managing to sleep and survive through a gun fight that happened outside my room. As I got dressed, called my family to say goodbye thinking that I may never see them again as the sharks in Bimini may eat me alive, I got in a taxi and headed to the airport. However, when I arrived at Fort Lauderdale International Airport, I looked around and noticed that there were no flights to Bimini, Bahamas and BIA airlines, our charter flight, was nowhere to be found. That is when I remembered a key line in our volunteer application that specifically stated that our flight leaves from Fort Lauderdale Executive Airport, not the International Airport. I quickly asked someone at the airport what the best way to get to the Executive Airport was and they suggested I hop on a Tri-Rail (a regional rail service) and take a taxi from there. As I got on the Tri-Rail, the conductor approached and asked me for my rail ticket; however, in New York, you can simply pay the conductor as he walks though so I originally didn’t feel the need to buy my rail ticket prior to getting on. Well, I quickly learned that you cannot do that in Florida so the conductor wrote me a ticket (a $25 fine) and I continued on my journey. Finally, I made it to BIA and was the last volunteer to arrive, so of course, as I walked into the little room, it seemed like a scene from an old movie where a record stops and everybody stops talking and slowly turns and stares. Being the nervous person that I am, I almost turned around and ran back out the front door. As all the volunteers got up to say hello, I saw Doc who happened to be sitting in the middle of all of them. Thinking of how to introduce myself and being a little wound up from the crazy morning, I went up to him, shook his hand and said, “Hi Craig, I’m Doc, it is great to meet you”. My momentary lapse in my ability for proper brain function resulted in a hilarious moment and one I will never forget. I guess it wasn’t the best way to meet Doc for the first time, but definitely broke the ice. As a volunteer, Doc gave me the opportunity to conduct research that was inspired by my childhood passion of beach net removal. 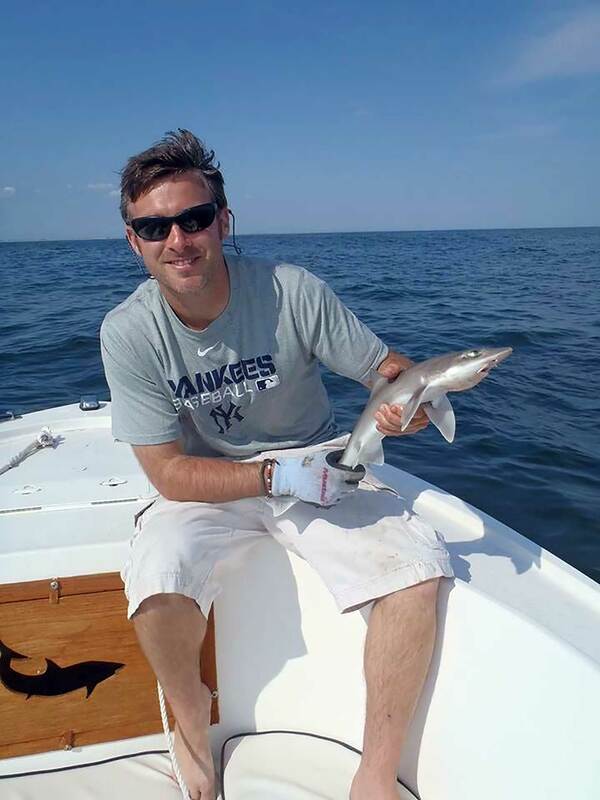 After sitting in an undergraduate Physics class and learning about magnets, and subsequently sitting through my Marine Biology class and learning about the ampullae of Lorenzini, I put two and two together and wanted to see if I could conduct a study where I use magnets to deter sharks from netted areas. As I approached Doc with the idea, he mentioned that my idea of how magnetic deterrents work was slightly off, so he sat me down and taught me what he knew. After this valuable lesson, my project began! It was also at this very moment, that the research staff captured a neonate/juvenile tiger shark (Galeocerdo cuvier), which I will refer to as the “striped beast”, and placed it in the back pen so they can study it and I can collect some of my first magnetoreception data. I quickly constructed my simplistic magnetic barrier, put the shark in the pen and got some exciting results. However, that excitement quickly faded as the shark became stressed and decided to lay on the substrate. So, knowing that we would have to quickly release the shark from where it was captured due to its apparent stress, I called into the lab and asked if there was a simple solution to get this shark moving again so I could just get some baseline data to determine if magnetic deterrents may be plausible. One of the staff members quickly replied, “Poke it with the net”. Taking their advice, I walked down from the observation tower and as a joke, one of my research assistants said: “I am going to film this whole thing just in case you scream like a girl.” I shrugged the comment off and I diligently and partially opened half of the pen, leaned over the side, and slowly moved the blunt end of the dipnet towards the tail of the shark. As I got closer, I slipped and poked the striped beast in the head, rather than the tail and this is when all hell broke loose. Upon pulling the net out of the pen, the striped beast decided to follow, biting at anything and everything and before I knew it, half of the shark was outside of the pen, just missing me with its chomping jaws. My heart was beating, I was continuously screaming like a young and petrified girl, but I recovered and swooped up the striped beast with the net. After I got the shark back in the pen, I closed the pen, we quickly went back to the lab to tell them the story and watch the video that was captured. As I stood there as everybody watched the clip over and over again, this is when I learned multiple lessons: (1) Don’t poke a shark in the head, (2) Manipulating wildlife is not a good way to obtain reliable data (remember I was very young at the time), and (3) Wear a diaper if you ever decide to play with a similarly-sized striped beast ever again. One does not realize their own capacity for success until they meet someone like Doc. By getting to work alongside Doc, I learned how scientific research is properly implemented and completed and it is those skills which are the driving factors in my research today. Essentially, Doc showed me what one can accomplish with hard work, the ability to ask the right questions (e.g. 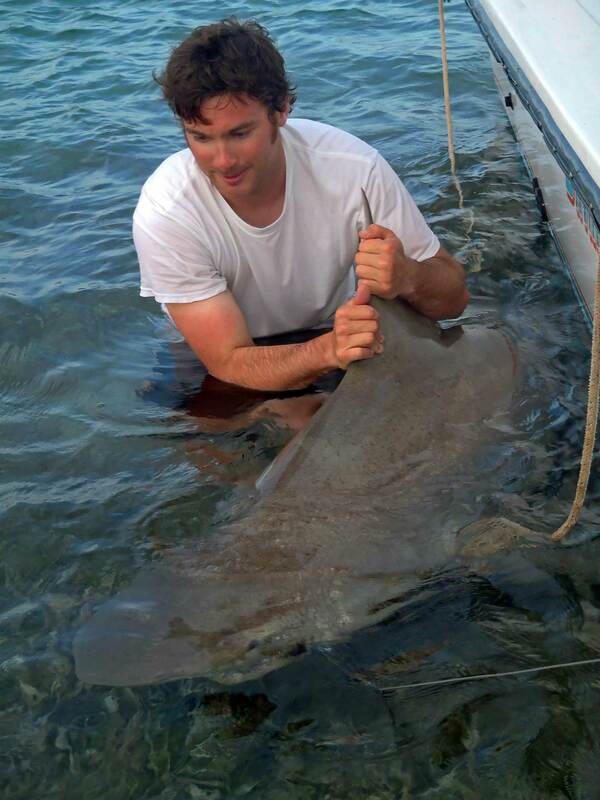 conduct meaningful Science), and how to successfully make shark research a career. Beyond this, I attribute a majority of my success to Doc and his staff, as they are the ones that continue to welcome me with open arms and help me with each element of my scientific research. Without them, there is absolutely no way I would be at the level that I am today.